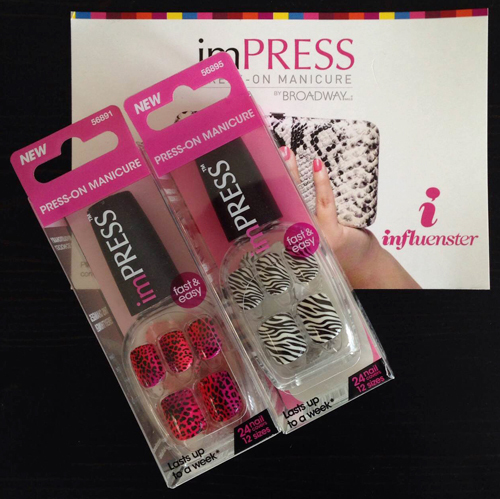 Fake nails have never really been my thing so when I received an Influenster VoxBox containing two sets of imPRESS Press-On Manicures by Broadway Nails I was initially reluctant to try them out. Plus, I must have been on the "wild animal print" list, for some reason, because the two designs I received are definitely not ones I would have chosen for myself (to put it nicely). After you assemble all the covers to fit your nails, application is super quick and easy. Wipe down your nails with the enclosed prep pad then peel off the adhesive backing and stick. The whole process took no time at all and I was left with a very eye-catching mani. While I don't think I would wear these regularly, the imPRESS Press-On Manicure is an excellent option for a night out when you don't have time to do your nails. There are also tons of designs available (french manis, basic colours, etc. ), so don't let the hideousness of the ones I received deter you from trying them out! I didn't expect to like these but I love how the zebra print looks on you! cute! i probably wouldn't try the zebra ones either but they look cuter on then i imagined! These look like they fit you really well. I personally like the zebra strips. Very trendy. They were a pretty good fit though I think people with small or super curved nail beds might have a tough time matching the covers to their nails. I have never been into press on nails or acrylics but these look surprisingly good! Fun pattern!